This really clarified how it is laid out. The description in text didn't make it clear to me. Yeah. I need to work on that. From what I gather from these snippets, this whole version of the One World was a result of nuking the gate on Homestead (or was is another dimension)? Instead of the other "normal" timeline where the gate was demolished but not nuked. As I understand it, that means that there is ALSO a new version of Warmonger Earth? 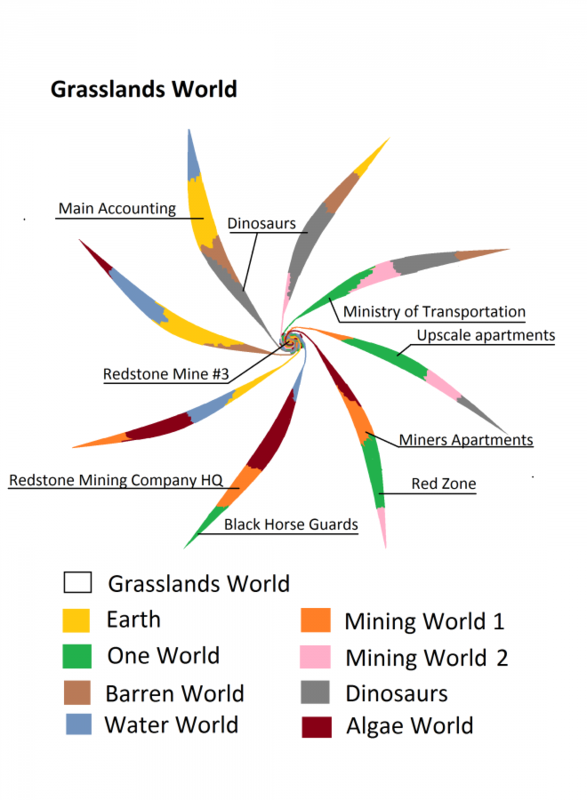 I don't really see evidence that the original Warmonger Earth is the "Earth" interaction here, and it also seems unclear if the Mining Worlds referenced are connected to the original or variant Warmonger Earth. The only saving grace is that then neither of these variants would interact with CometFall. I suppose everything could work ok if you keep separation from the original timelines once Ebsa leaves, but it sounded like you intended to have them come back to help. I hate to say it, but this seems manifestly overconfused to the original story line. We have Nuked One World and Nuked Earth. Nuked Earth was (slightly) less affected than the One World, but the inbetween is messed up. Think of it as a local whirlpool. The Earth's gate tech worked with fewer glitches, but every world they touched got sucked into the whirlpool. Seven of them. So we have eight worlds with patches of the other worlds swapped. And six other worlds, with Earthers and Oners and dinosaurs . . . I guess I'd better figure out a place to shoehorn that in. Along with "I'm really glad we've merely got a few dinos, Miners, Earthers and _other_ Oners to worry about. Let's concentrate on that." I might consider the whirlpool to have whipped all eight worlds off in different directions as it unraveled. Now Q just has to try to find those world, priority getting people off the Dino world and the water world. And rescuing Oners from Nuked Earth, and Earthers from Nuked One. Miners ditto, when they actually want to be rescued, and returned to their ancestors now-independent homeworlds. And getting Nuked Earth and Nuked One to talk peacefully to each other and their appalled close splits. The Grasslands guys are going to be low priority and hard to find. I'd say they've got four or five years before Q hunts them down. Ugh, that was Holly. Being too lazy to sign in. Sorry. They didn't merge, they swapped chunks. And I think the "whirlpool" in the inbetween that had sucked every connected world into it has snapped and tossed everything away. No more swaps, no more problems with powered gates--although one suspects they'll both be really cautious about using them. Disco is going to be busy, and it will be awhile before they track down the last world. I'm contemplating having the smugglers discover it, but I think I've got too many complications already. And by "world" I mean "entire parallel universe" not loose mini-verses. Xen rested his elbows on the lectern and eyed the belligerent parties. "At a bare minimum, I trust that you realize that nuking a working gate is a really bad idea, damaging both parties?" He got glares in return. "We have learned that there are interactions between membranes, and with the inbetween that WE DO NOT UNDERSTAND. Please stop before you destroy yourselves." "And we want our colonies back, and our mining worlds. All of them." Montgomery raised an eyebrow. "Go talk to them. If there's any interest, I'm sure they'll vote on the matter." His smirk was not terribly well concealed. Xen resisted an impulse to thump his head--or better yet, theirs--on something hard. Lon and Inso had both stepped aside--"interested parties, you know"--and dumped this all in his hands. "Gentlemen, I assure you, there are plenty of worlds out there that will have all the colonization potential and all the mineral riches you could want, and that no one else has claimed. Now, Ambassador Kellog? Am I correct in my understanding that Nuke Earth had one planet being studied prior to colonization but that you had no personnel on the world when everything went sideways?" Glare. "There was a sizable cadre of civilian scientists investigating the world. They . . . switched with a chunk of Earth. There are no personnel stranded. Apart. Of course, from all the people in Main Accounting, which has gone missing, and so far, has not been found." Thank you. This diagram is fantastic. The verbal description was good but this is one of those complicated things to visualize with just words.